The Breville BES840XL semi-automatic coffee machine provides amazing bang for your buck. For those who really love their coffee, this espresso machine is perfect; you’ll save money by not buying from a café, you’ll get delicious coffee, and you get a beautiful looking machine that will look great on any kitchen counter top. The BES840XL features a thermocoil and a PID controller for temperature control, making sure that with this machine, each coffee shot you make is consistent in temperature. It also has the all-important steam wand, with a 360 degree swivel head, and a removable water reservoir. It also comes with single- and double-wall filters, a portafilter, a frothing pitcher, and a tamper. 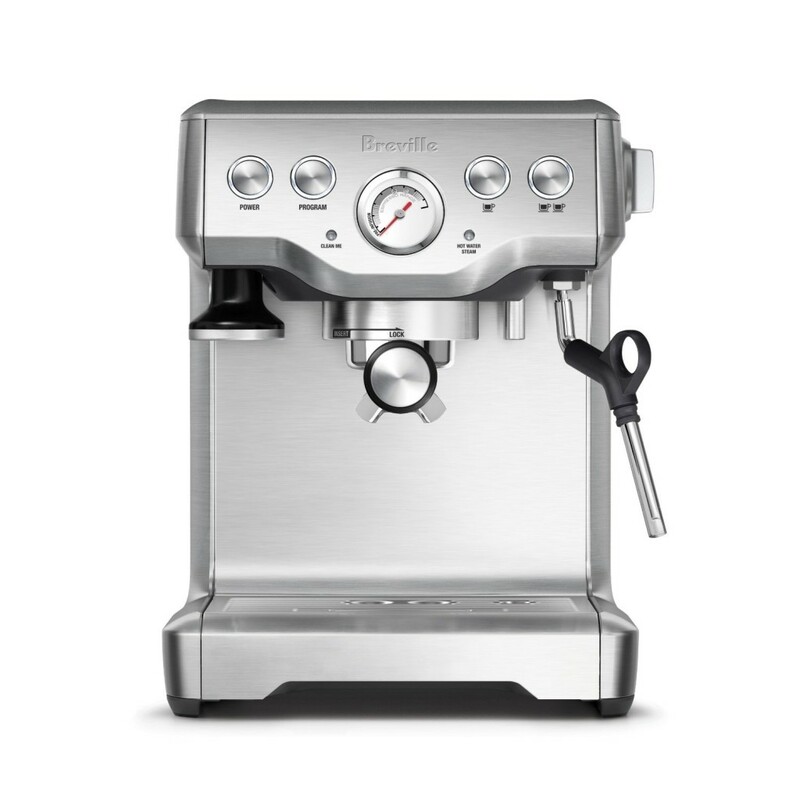 The machine itself is in the classic Breville style – quality plastic and sleek metal. It’s a lightweight machine with a small footprint, so it fits well on almost any kitchen surface, and is easy to move around. The hidden tool-storage compartment under the drip tray allows you to keep everything you need for your espresso machine close at hand, but neatly out of sight. A highly automated machine, the Breville BES840XL is a great buy for the safety conscious- it automatically flushes it’s own system and shuts off once the automated process is complete. The machine’s volume can also be programmed, and a pressure gauge on the front of the machine allows you to see exactly how much you’re extracting from your coffee, allowing you to dictate exactly how your espresso tastes. The machine even tells you when it needs to be descaled, by turning on a small indicator light, and when the drip tray needs to be emptied, with a little pop-up sign in the drip-tray that says “Empty me!”. For an entry-level espresso infuser, the BES840XL produces a shot that will not disappoint. While pre-ground beans are perfectly fine in the infuser, when using freshly ground beans, this Breville BES840XL produces a exceptional tasting espresso. Make sure to only grind your bean as finely as is necessary, and you will really reap the benefits of this infuser; grinding the bean too finely might clog the machine and ruin your coffee. The built in pressure gauge on the front of the machine is an invaluable tool to help you to dictate exactly how your coffee tastes. While the swivel head steam wand is very useful for fitting either the dedicated milk pitcher or your own choice of pitcher underneath, the milk foaming quality is not as high as it would be from a machine with a dedicated boiler. The thermocoil is slowly foaming milk, and it has no thermometer to help make sure you don’t under- or over- steam, but it does produce a good quality microfoam once you get to learn how the steamer operates. The wand, however, when dispensing hot water, matches even machines of a much higher budget. All in all, the Breville BES840XL espresso machine is a high-quality espresso machine, absolutely ideal for those starting out making their own espressos, or for those looking for a lightweight, low-footprint, and simple to use machine for day-to-day coffee making.